Successfully Added Infrared Digital Thermometer Gun to your Shopping Cart. New human and animal Infrared Digital Thermometer Gun. This is the safest method of quickly taking a persons temperature without any direct contact whatsoever. Designed to display temperatures in both Celsius and Fahrenheit, with a back light function for easier temperature reading during low light conditions, this is the easiest to use IR thermometer on the market today! This thermometer is perfect for anyone with children or other small creatures. Providing accurate reading and immediate response, now you can take your child's temperature at any time. If your child is ill, this thermometer gives you the ability to monitor their condition and respond immediately if temperatures rise too high. With the world ever changing so rapidly, every home should have this medical accessory added to their first aid kit. Using this thermometer is easy, safe, and pleasant for everyone involved. Just aim within 1-5 CM of the forehead and pull the trigger. The LCD screen instantly displays the temperature, and with one click you can view the temperature in Celsius or Fahrenheit. The infrared thermometer works by measuring the surface temperature of the human body. The units optics sensors emits the (IR) and the transmitted (IR) reflects back to the thermometer to provide you with an accurate reading thanks to the internal sophisticated electronics system that calculates and translates the temperature for our simple reading in Celsius or Fahrenheit. This device starts paying for itself immediately by saving you time, money, and worry. It's a must-have item for parents and travelers worried about picking up Swine Flu, Malaria or any other illnesses that has fever as a first symptom. This product is in stock in our warehouse and is available for single piece or bulk stock orders. Order yours today and we will ship it out tomorrow! Can this thermometer detect Swine Flu (H1N1)? This thermometer measures temperature. It will not directly tell you if someone has Swine Flu, but it will monitor your and others' temperatures to be on the look out for high temperatures and fever. 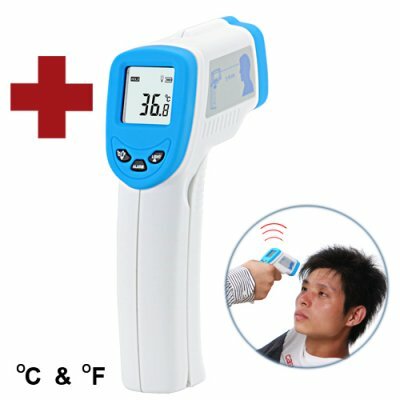 If I use this IR thermometer to take someone's temperature, will they feel anything? No, absolutely nothing. They will not even know you are taking their temperature. Yes. This thermometer uses infrared to read temperatures, which is perfectly safe.